Working across a variety of media, including drawing, sculpture, and film, Katy Schimert uses fragments of personal experience as conceptual impetus. The intersection of the fine and decorative arts is a formal point of departure for the artist. 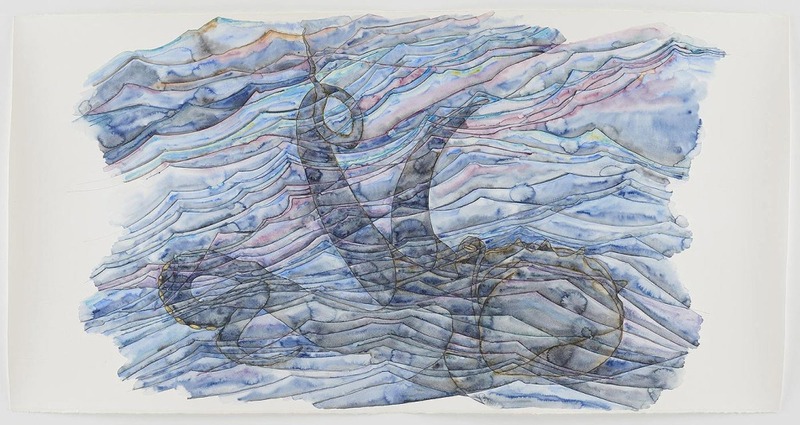 Densely layered and vaguely topographical, her drawings suggest sequences of cosmic or otherworldly events occasionally populated by ethereal human figures; as Schimert describes it, they create a “space for illusion.” The results of this investigation are not only visually compelling, but formally succinct – this allows Schimert’s works in various media to meld together as an ongoing visual essay. This exhibition will comprise a series of large-scale watercolors and ceramic and glass sculptures about the sea and a large mythical octopus, a hidden sculptural force, and ghost like presence of fierce emotion underneath the moray effect of water. Schimert has been inspired by literature of the sea and science fiction including: Jules Verne, Herman Melville, Joseph Conrad, Patrick Obrien, Arthur C Clark and Marianne Moore’s poem The Octopus. She uses an ancient method of casting glass and ceramics, making forms through a process of heating and cooling. For more inquiry on Katy Schimert’s works, send us a message.